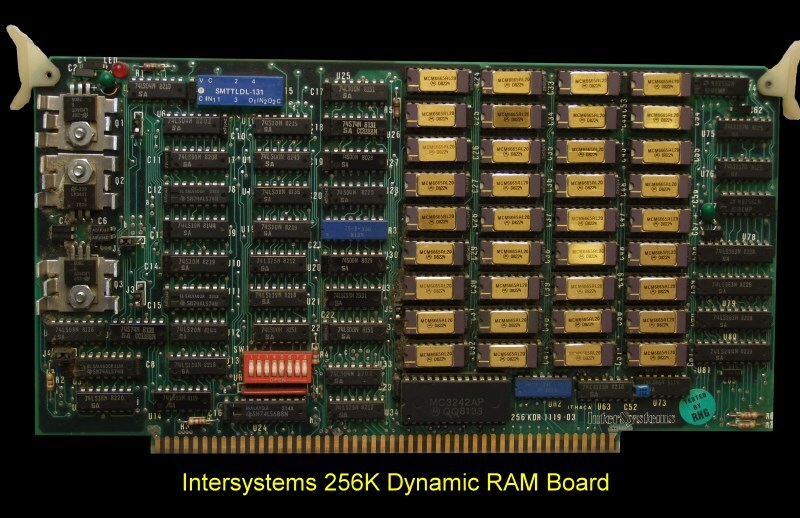 Intersystems 256K Dynamic RAM Card. This was Intersystems final Dynamic RAM card. Byte or Word Data Transfer. Whether you were using an 8 bit processor or an 16 bit processors, the board's data bus automatically adjusted to the requested word width. You could even run a 16 bit processor and an 8 bit Direct Memory Access Controller concurrently in the same bus. Parity error checking for all read and write cycles. Standard or Extended Addressing- The memory board could be addressed in either the standard 16 bit address space (64K)or in the extended 24 bit address space (16 megabytes). Onboard arbitration and sequencing logic- This circuitry allowed continuous DMA transfers of any size and error-free operation during waits, halts, or resets. High Speed Operation. The board could be configured for either 2, 4 or 6 MHz operation without wait states. All timing was completely IEEE S-100 compatible.Precise delay line timing- There were no one shots, oscillators, or RC delays.Uses both transparent and default refresh. Designed to use 64K dynamic memory chips. Phantom and Error. These S-100 lines assisted in bootstrapping and memory protection. Low Power/Low Heat Design. Low power not only meant less drain on the system power supply, but higher reliability and longer chip life as well.Damped Array. All lines driving the memory array included small series damping resistors, reducing array noise and improving reliability. Wait State Generator. One wait state could optionally be generated on the board for Ml or any board access.Simple board setup. The board had only 4 jumpers! The manual can be obtained from here. The schematic can be obtained here.